- Sleek and stylish. 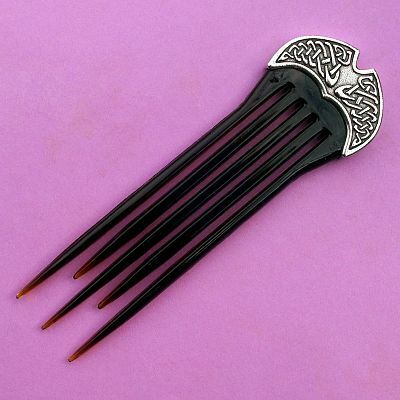 Perfect for holding an upswept hairstyle in place. The pewter cap is double-sided so the design can be enjoyed from the front and the back. Comb measures 5 1/2" tall. 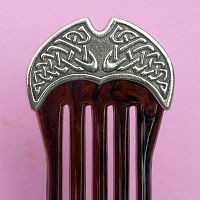 Do you have any other questions about our Celtic Hair Comb? I really love this hair comb. It has become my go-to hairpin for the office. My hair is to my waist and is of medium thickness. Using this comb I can roll my hair into a bun, and it is the only thing I need to keep the bun in place all day! The comb is sturdy, but no so heavy as to make my hairstyle droop when I wear it.